Boost your self-esteem with this book of epic fails, strategically designed to make you feel smarter. Boost your self-esteem with this book of utter failure, strategically designed to make you feel smarter. F this Test is a cherished collection of completely terrible test answers, ranging from the clueless to the downright dumb. Topics such as literature (Q: What is the theme of Madame Bovary? A: Cows) and science (Q: What is a meteor? A: An animal that eats meat) are discussed to make you feel like the top of the class. Made in China. Can't wait to read this allowed at the holidays while we are sitting and having dinner. It's hard not to get a kick out of these "answers." My Mom is a 2nd grade teacher so these funny answers from her own students are often a topic of conversation. 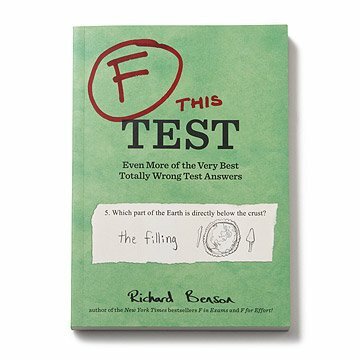 This is not a book recalling dumb mistakes but recounts very humorous responses by students who haven't got a clue as to the correct answer to a test question. We've all been there..... Gave us a lot of laughs reading these out loud during family Xmas gatherings. Bought this for my teenaged nephew who really enjoys a good laugh. Did not disappoint. This is a example or two per page of the ideas older kids came up with to try to get points without knowing the answer. My vary sarcastic son thought it was very funny, the adults that have picked it up here and there have had a good chuckle too. A quick fun read but not a book you read over and over. It will be a good one to pass around the family. Probably not a good one for kids under 12 as much of the humor might need to be explained to kids that haven't experienced middle school and up classes. purchased for two teachers-they both loved it! Need a laugh? This is it. Bought for my step dad who's favorite part of day is finally sitting on his toilet to relax and read. He works 7 days a week, 15 hour days, no joke. So I thought this would be a great gift to make him laugh at end of day during his relax time.